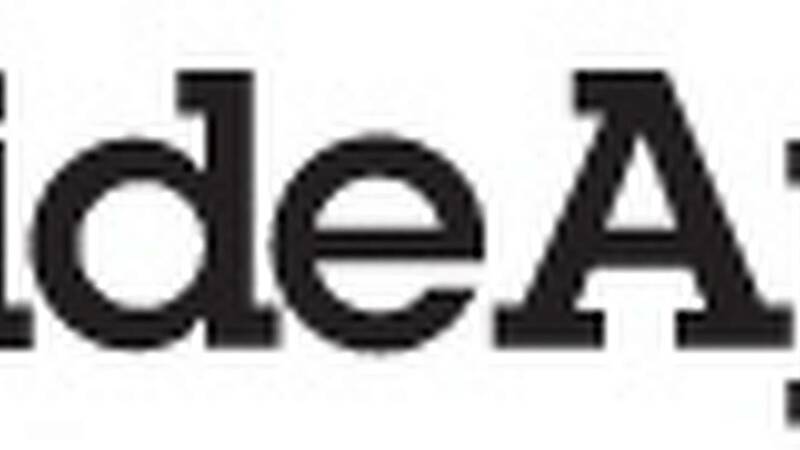 Evaluating bikes by how they ride and comparing aftermarket parts by how they improve the bike, are typically measured by rider’s feel, which is a very subjective gauge. 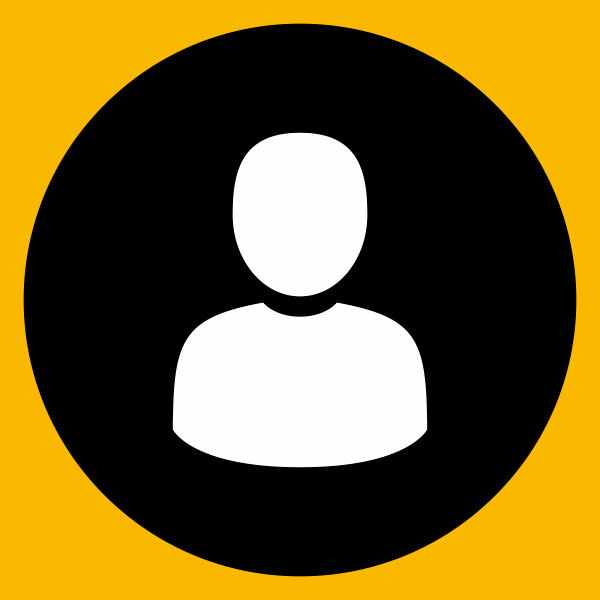 So, obtaining hard numbers is always a good way to provide more concrete evidence of how much or how little something has improved the bike's performance. When power output is at question, a dynamometer is an excellent tool for gathering this sort of data. 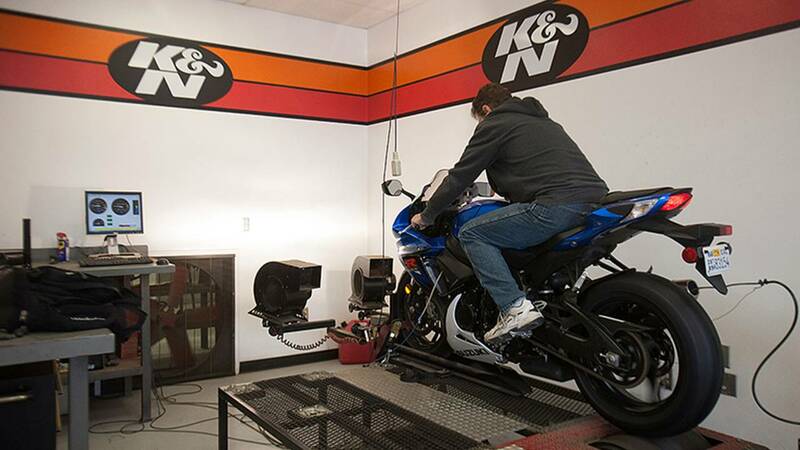 K&N Engineering was gracious enough to offer their dyno to see what kind of numbers our 2014 Suzuki GSX-R600 project bike is putting down with the help of aftermarket exhaust, fuel controller and several different types of K&N air filters. K&N’s motorcycle dyno tuning expert developed the best plan of attack to obtain the comparative info we were looking for. We would first run the bike on the dyno in 100% stock form, just as it came from the factory. We would then install the K&N Hi-Flow filter and run the bike on the dyno again. The K&N Race-Spec filter would then be installed for another dyno reading. Next, the Akrapovic exhaust and Bazzaz electronics would be installed before running the bike with the OEM, Hi-Flow then Race-Spec air filters. This would result in 6 sets of numbers to compare, while only changing one variable at a time, enabling us to pinpoint which modifications had the most effect on a change in power output. *NOTE: The only time more than one variable will be adjusted at once is between runs 3 and 4 when the exhaust AND electronics are installed. 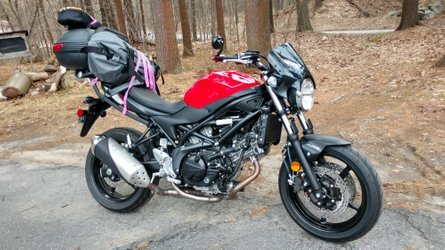 This decision was made because of a concern that the bike would not run properly by installing ONLY the full exhaust system OR the fuel/air/ignition electronic units independently due to the ECU’s inability to calibrate the mapping and make the proper adjustments to compensate for the modifications. Additionally, the bike will be ran for a significant amount of time, throughout the RPM range for the system to recalibrate itself before readings are taken. The technician will also conduct multiple cycles on the dyno until the readings stabilize and a confident figure is produced. 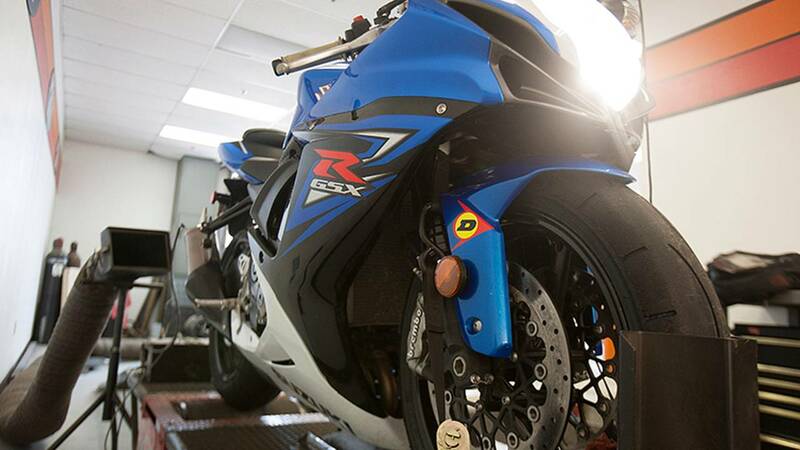 Our stock 2014 Suzuki GSX-R600 put down about 102 horsepower and 44 fl/lbs of torque on K&N’s DynoJet dynamometer unit. Each bike and dyno machine is different and produce slightly different figures but these numbers were right about where we anticipated our baseline to be. 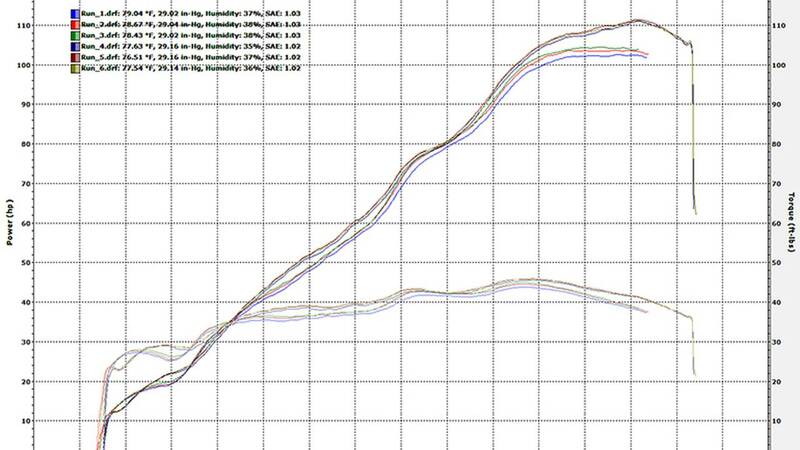 Adding just the K&N “Hi-Flow” filter surprisingly resulted in a gain of nearly 3 HP and 1.5 ft/lbs of torque while the “Race-Spec” filter hardly produced any further gains. Once the full Akrapovic exhaust system and Bazzaz fuel/air/ignition and self-mapper modules were installed along with the “Hi-Flow” air filter, we witnessed our highest power output of the day at over 111 HP and 46 ft/lbs of torque. This is nearly 10 HP over stock output and 2 ft/lbs more torque, roughly a 10% and 5% gain respectively. Additionally, peak power was delivered further up the RPM range. 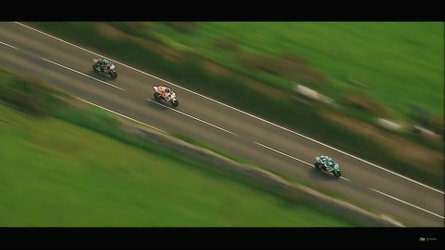 The 111 HP figure was achieved at an engine speed roughly 1,000 RPM greater than the 102 HP number hit with the stock bike. 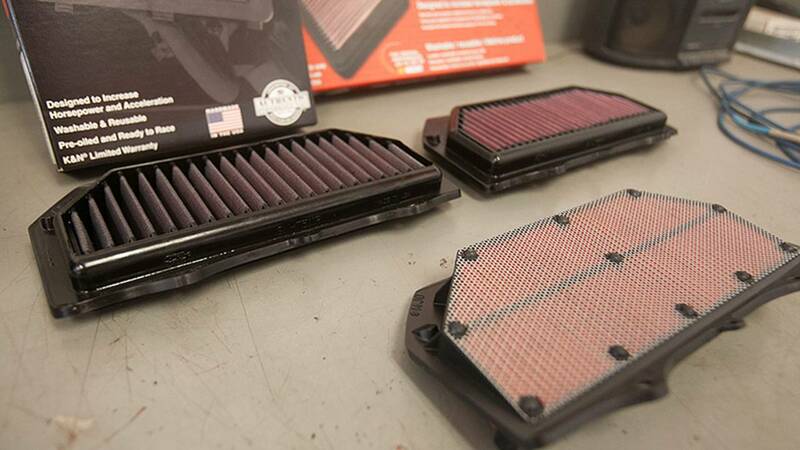 Another interesting aspect of the results was the underperformance of the K&N “Race-Spec” air filter. This filter produced about the same figures as the “Hi-Flow” filter on the stock bike and even lower numbers with the exhaust and electronics modifications. Perhaps the 2-ply cotton filter did not provide enough airflow resistance compared to the 4-ply cotton “Hi-Flow” filter or the paper OEM filter. It was also noticed that the air/fuel curve was much smoother with the stock electronics than the rough curve the Bazzaz units produced with many spikes and dips. It seems as if the OEM Suzuki ECU is able to create a much more stable and consistent air/fuel map than the Bazzaz module but this was not an imperfection that could be detected by the human eye, ear or touch. 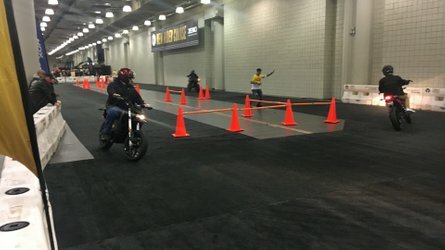 Gauging a bike’s performance by how much power is output is just one aspect in evaluating a motorcycle as a whole. 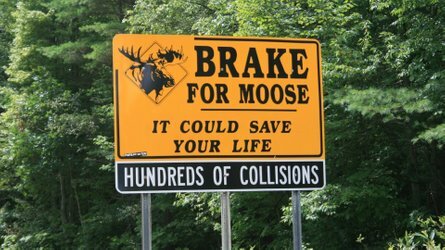 However, this tends to be a very popular metric of discussion, especially in the sportbike realm. 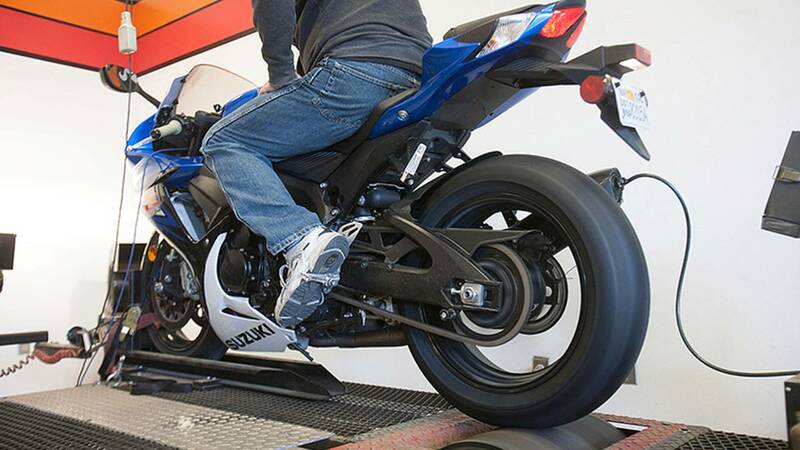 Utilizing a dyno is the best way to uncover these metrics but even each dyno and motorcycle has a bit of variance of its own. 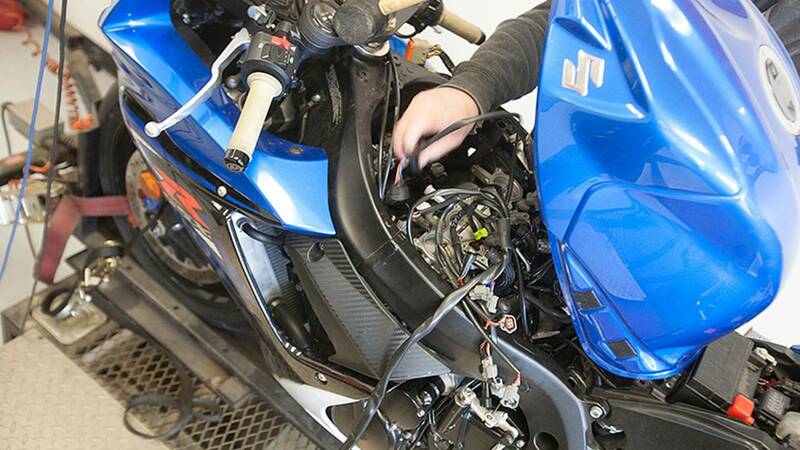 Regardless, in our specific test, we determined that our 2014 Suzuki GSX-R600 puts down decent power right out of the box and reacts quite well to modifications, even those as simple as an air filter. HP gains cost us only $28 per pony when adding just a K&N Hi-Flow air filter and just over $400 when going for the true performance package of installing an Akrapovic full racing exhaust, Bazzaz air/fuel/ignition modules and K&N Hi-Flow air filter. 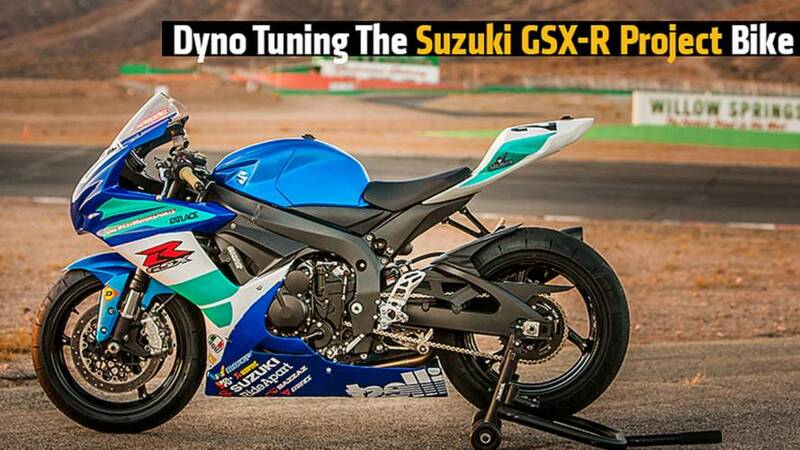 Though many more benefits are realized beyond simple peak power gains with these extensive modifications (stay tuned for full reports on each aftermarket part), it was impressive to see the GSX-R powerplant react so well on the dyno to these additions. What modifications have you seen to be most advantageous on the dyno?